By Chris Williams: IBF World super flyweight champion Jerwin Ancajas (30-1-1, 20 KOs) retained his title with a one-sided 12 round unanimous decision over mandatory challenger Jonas Sultan (14-4, 9 KOs) on Saturday night at the Save Mart Arena in Fresno, California. The judges’ scored were 119-109, 117-111 and 119-109. Boxing News 24 scored it 119-109 for Ancajas. Sultan appeared to win just the 9th round, as he was too small, too weak and too inactive for him to get the victory tonight. The 5’6” Ancajas didn’t look great, not even close. Ancajas was facing a beatable guy that looked too small for him in 5’4” Sultan. After weeks of hype about the Ancajas-Sultan fight, it failed to live up to the billing. This was not the war that many boxing fans thought it would be. It wasn’t an exciting fight. It was more of a clinical performance by Ancajas against a limited fighter that lacked the size, punching power and the ring IQ to give him any troubles. Sultan tried his best with his limited physical talents, but he didn’t have the power or size to worry Ancajas. In every round but the 9th, Ancajas landed the cleaner and harder shots. Sultan was getting his shots through the guard of Ancajas, but they lacked the power to do any damage to him. 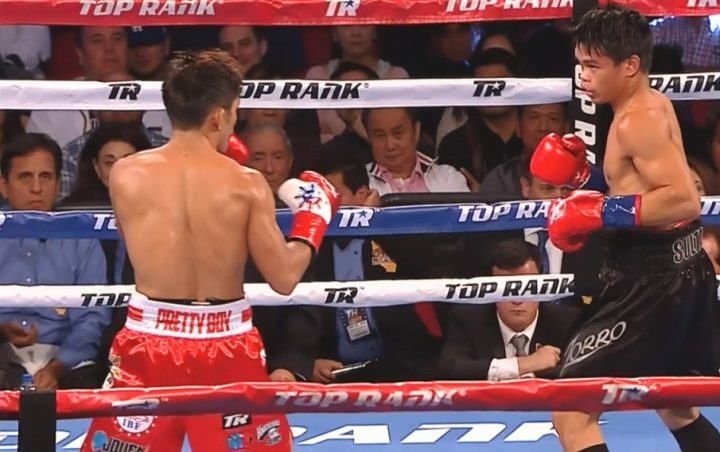 Ancajas did an excellent job of making Sultan pay for every shot he connected with. Ancajas is not Manny Pacquiao 2.0. If anything, he’s more like Terence Crawford with the way counters his opponents with heavy shots. Ancajas doesn’t have the speed that Crawford has going for him. Ancajas controlled the fight in rounds 1 through 8 with his jab and left-hand power shots. In the 9th and 10th, Ancajas slowed down and was getting hit with some shots from Sultan. The punches landed the power to hurt Ancajas. He took the shots without any problems and continued to land his hard jabs. In rounds 11 and 12, Ancajas retook control of the fight and coasted the rest of the way. There wasn’t much ambition from either fighter in the last two rounds. Ancajas appeared to just want to get through the fight, and Sultan wasn’t willing to push the pace for some reason. Both fighters showed excellent boxing skills. I got to give them that, but there wasn’t the full all out aggression that other fighters in the super flyweight division typically show. For example, if this was WBC super flyweight champion Srisaket Sor Rungvisai inside the ring with Sultan tonight, he would have been in a world of hurt. Rungvisai would have been looking to take Jonas’ head off with every shot. Ancajas wasn’t doing that. He was taking his time, fighting like he was in no rush to try and hurt Jonas. I hate to say it but Ancajas looked lazy, and not concerned with trying to put on a good show, He fought like he just wanted to get the victory and not worry about breaking a sweat against a smaller fighter. Neither guy was hurt tonight. Ancajas was throwing too many single shots, and not putting his punches together and looking to attack Sultan. If Ancajas were capable of throwing combinations and being aggressive, he would likely have knocked Sultan out, but that’s not how he fights. Ancajas wasn’t taking the fight to Sultan to try and get him out of there. I don’t think Ancajas was taking it easy on Sultan. He’s not a very fast guy to begin with, and he seems to have stamina problems. It’s fortunate that Ancajas and Sultan didn’t meet up with former WBO super flyweight champion Naoya Inoue when he was still competing in the division, because I think he would beat both with ease. Inoue on a different level both limited fighters. Ancajas is a decent champion, but he’s more of a belt holder type of champion than a true champion. The Ancajas vs. Sultan fight made history, as it was the first time in 93 years that two Filipino fighters competed for a world title against each other. Before tonight, the last time two Filipino figthers competed for a world title was way back in May 1925 when Poncho Villa defeated Clever Sencio. That fight was likely more interesting than tonight’s match between Ancajas and Sultan, which was on the boring side. Ancajas came into the fight being compared to Manny Pacquiao but it’s clear that he’s nothing like him. Pacquiao is an all action fighter, who attacks nonstop. Ancajas is more of a jab, single punch, and counter puncher-puncher. Ancajas is slow and methodical. He does have heavy hands, and he’s an excellent body puncher, but he’s not combination guys with blinding speed like Pacquiao, and he lacks his high-volume output. Ancajas is missing in several areas that would prevent him from being the next Pacquiao. Ancajas is more of a technical boxer than Pacquiao, and he doesn’t have the speed that is needed for him to be a dangerous guy. You can see why Top Rank hasn’t put Ancajas against the likes of Srisaket Sor Rungvisai, Roman Gonzalez and Juan Francisco Estrada. Those guys would all beat Ancajas in my opinion. If Top Rank believed that Ancajas was good enough to defeat those guys, they would have made those fights when they first started promoting him. The fact that they haven’t even made mention of wanting to match Ancajas against Rungvisai, Estrada and Gonalez is telling. It shows you that they have reservations about him. Donnie Nietes is also someone that I would pick to beat Ancajas. Nietes, 35, just moved up to super flyweight after holding down a title at flyweight, and he’s the real deal. Nietes has a ton of talent, and he’s someone that could unify the division. It’s going to be interesting to see what Bob Arum of Top Rank does with Ancajas. Is only going to match him against Khalid Yafai or will he look to really test him by putting him in with a dangerous fighter like Rungvisai or Nietes. Arum hasn’t said anything about wanting to match Ancajas against Rungvisai or Nietes, so I must believe that he doesn’t fancy the idea of making those fights.